​Are you ready to transform your play?! ​﻿﻿﻿Featuring 50 easy activities for babies and toddlers so you'll never have to trawl Pinterest for fresh ideas again! Each activity is super simple to set up using materials you probably already have around the house. No shopping for expensive resources required! ﻿﻿﻿Grab your copy for just $16.50! Do you ever feel overwhelmed by all of those amazing educators and parents who seem to have it all together? What do other educators think of the eBook? 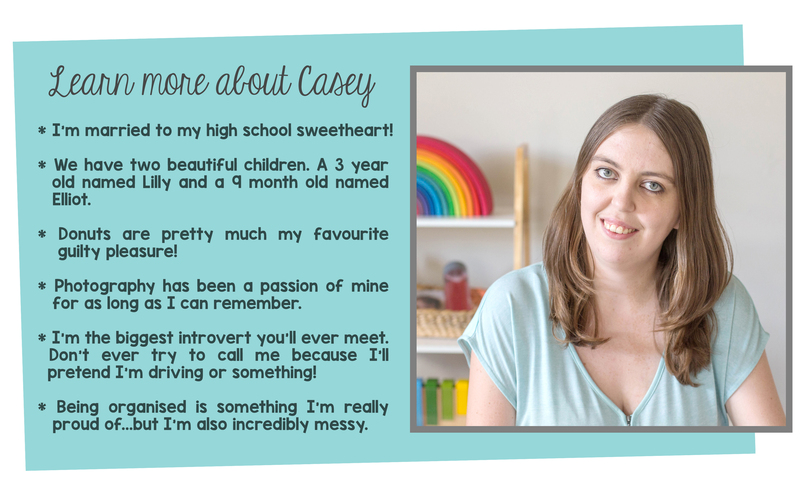 "Casey has carefully considered the needs of different aged babies and toddlers, but I can imagine Miss M (who’s nearly 4) having fun with lots of the ideas. Her photographs in the book are light, bright and beautiful and capture the essence of the play experience. The activities aren’t too complex and do not require many materials to be purchased – some you probably have around the home already. Bottom line is sensory play is such a crucial part of a child’s holistic development and Casey’s book is a fantastic resource." 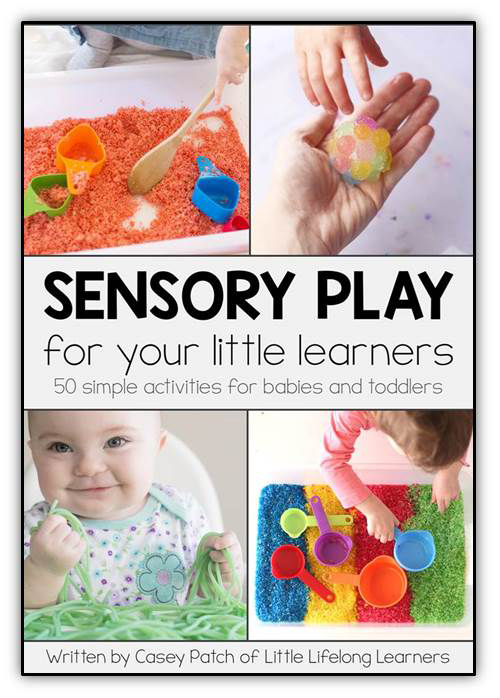 Get instant access to the SENSORY PLAY EBOOK now! 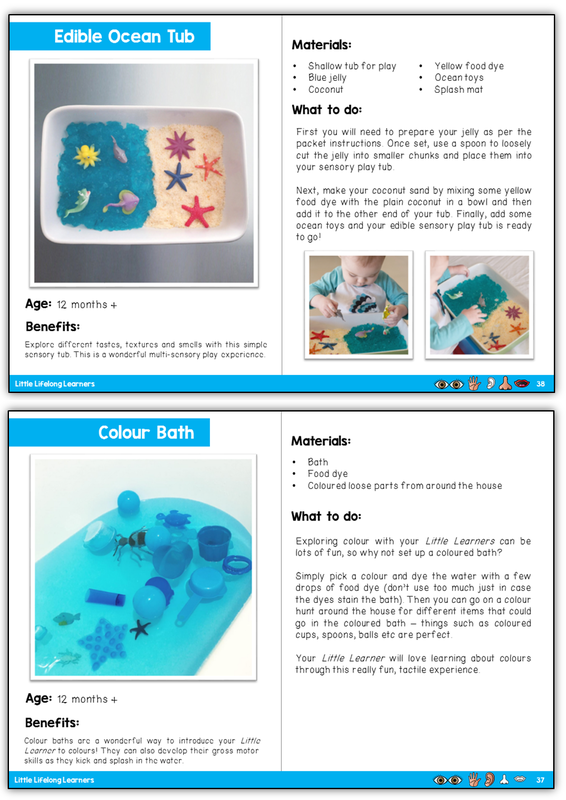 Inside, you’ll find ideas for water play, sensory bottles, outside play, messy play and even ideas that are suitable for bath time! 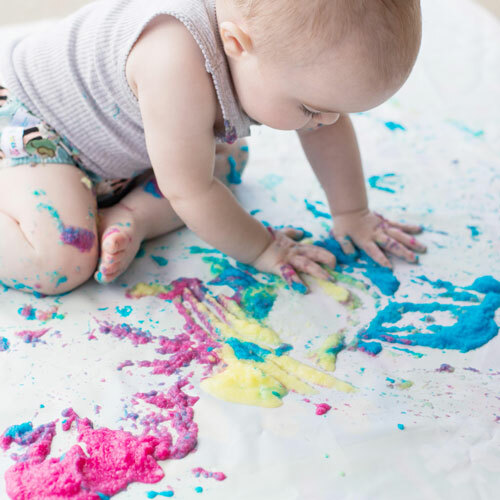 Stop the guesswork trying to find activities suitable for YOUR little learner because every activity has a suggested age range beginning from newborns all the way up to toddlers! Yes! I want to download a copy right now! Still wondering if this eBook is right for you? ﻿﻿You﻿﻿ love sensory play but you're not sure where to go for ideas and inspiration! You're tired of finding fancy activities that require lots of expensive or hard-to-find materials! ﻿﻿You spend hours searching for ideas that will actually work with your own little learners﻿﻿! You value play-based learning and want to provide your little learners with a memorable childhood! After payment clears, you’ll receive an email with a link to the download. You can save this straight to your phone or iPad so that you can access it anywhere at any time! Be sure to backup your eBook just in case. Is this eBook available in hardcopy? Sorry, not at this stage! Not only am I completely passionate about children learning through play, I’m also a fully qualified teacher who graduated with second class honors. Each activity detailed in this eBook has been road tested by myself and my two little ones so you can be assured they are all fabulous and exciting! Is this eBook suitable for my 3/6/9 month old? The activities in this book are suitable for children from birth to around 4 years of age. If your is on the younger age of the spectrum, there are activities that will not suit straight away. But your little one will grow so quickly (seriously, it will flash by right in front of your eyes!!!) and they will be able to enjoy every activity in the book eventually! How many of the activities are suitable for a newborn? 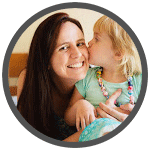 The first 11 experiences in the book are perfect for newborns right up to 3 months of age. Okay, but what if I don't like the eBook?? Please email me at [email protected] and we can have a chat. I offer a 100% money-back guarantee if you are unsatisfied with the product or it’s not what you imagined. Just be sure to email me within 5 days of purchase and we can get it sorted. Yes! I want to get started with sensory play right now!